This month we thought it was time to give Henry an allowance. He is four and a half and he has a basic understanding of numbers. We decided to give it to him on the day we get our paycheck (once a month). We gave him a total of $6 : $1 to give, $1 to save, $4 to do with what he wants. I realize we could do the whole 10% save/give thing, but I didn't want to have to break things down into coins. Making sure I have six dollar bills will be enough. We plan to keep the $1 give/save the same until he is 10, and can possibly get some understanding of percentages. We decided that we were not going to tie his base allowance to chores. There are things around the house that we expect him to do because he is a part of our family: pick up toys, clean up messes he's made to the best of his ability, put his dishes in the sink or dishwasher, and put his clean laundry away. He will get the allowance no matter his performance is on the expected tasks we have for him right now. We will also give him the opportunity to earn more money by doing other things: cleaning out the car, picking up sticks in the yard, etc. So, how did this month go? He had and extra dollar bill in his giraffe bank plus a lot of change, so we cleared that out and allowed him to keep the extra dollar for himself, so he started with $5. Well, he'd blown all but 60 cents of his money two days after he got it. Right after we sat down and talked with Henry about his allowance, he gave us HUGE hugs and was so excited. He took his nap, then woke up and wanted to go to the toy store (a.k.a. Dollar Tree) and came home with these three treasures: a Spider-Man figure, a little monster truck, and a Spider-Man blow up sword. The next day we went to the grocery store, and he wanted to buy a Matchbox car. So, he brought along his wallet, picked out a car, and paid for it himself. He then had 60 cents left. Russ and I also talked about how we want him to learn about tax and such, so we said we'd never front him tax. He'd have to learn that just because it says $1 doesn't mean that is always exactly what comes out of your wallet. The next weekend we were going to go to a flea market with my parents. I knew he would want to buy something there, but that his 60 cents wouldn't go far. The couple days before we told him about the upcoming event and that we would give him a couple chances to earn some money. We had him pick up sticks after we tore out a bush from the side of our house to earn a dollar. It was a bit of a daunting task, and he whined for help at first. We stepped back and told him that if he wanted to earn the money, he needed to do the work, and he did end up completing the job. The morning before we left for the flea market, Russ went out to the car with Henry and had him vacuum it out and take out all the trash to earn another dollar. Russ again just stood back and Henry did it all. He was thrilled when he got to the flea market and could buy some things (plus my mom wanted to give him some money, so she just matched what he had earned). Henry came home from the flea market with a wind up space ship, a matchbox truck, and two American flags. He got two flags because he wanted to give one to Wesley. I thought that was so sweet. He really does think of his brother a lot. The last chunk of his money (50 of the 60 cents) was spent in the claw game at Pizza Ranch (the local pizza buffet). Henry was DEVASTATED when he didn't win a prize from the claw game and threw a small embarrassing fit at the restaurant. I almost could have bet that would happen, but it was a lesson he needed to learn. I guess we'll see if he puts his own money in a chance game again. We also are in the midst of repainting our house, and had some clean up that needed to happen with the paint that was scraped off the garage. Russ gave Henry the opportunity to clean it up in exchange for a dollar and he declined, I think because it seemed too difficult and might take a while. I explained to him that making money takes hard work. He's already asked when he gets more money. I realize that a month is a long time for him, but I also don't think giving a dollar a week is the best for him either. Four dollars isn't much. He'll probably continue to buy little trinket things for a while, since that's all he can afford, but that's how he will learn. He loves watching You Tube toy reviews and talks about wanting things he sees on there sometimes. It'll be interesting to see when he starts to save his spending money over a couple months to get something larger. I don't expect it to happen any time soon, but we'll keep having conversations with him about it. So, that's how we're doing allowance, at least how we're starting out anyways. 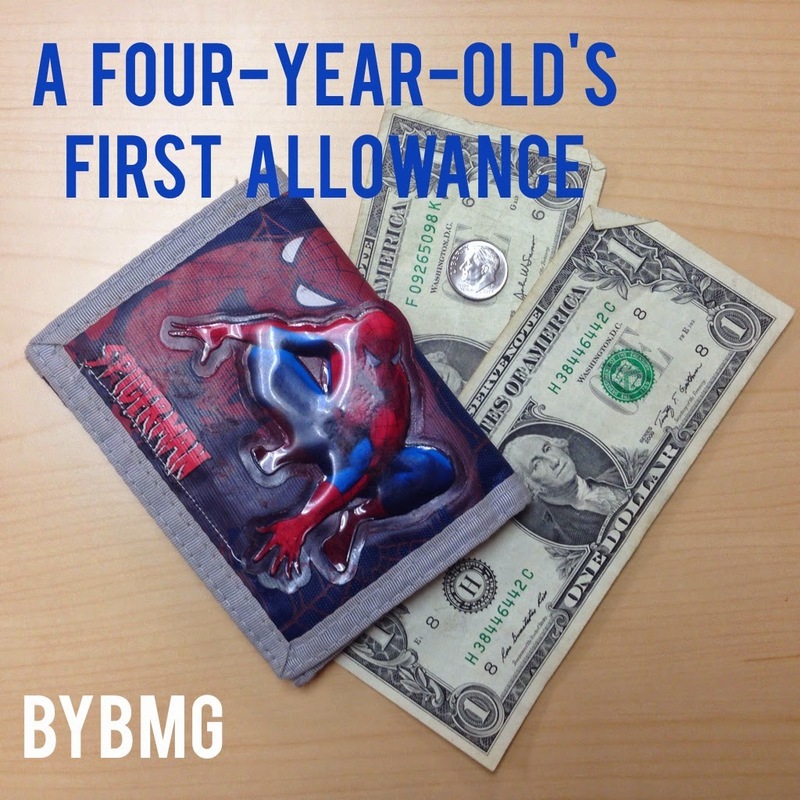 Do you give your kiddos allowance? What age do you think is a good age to start? How much? I'd love to hear from you in the comments!